In the past few years Budapest has become a go-to destination for travellers looking for a budget European destination, and I can definitely see why. The Hungarian capital has it all, from stunning architecture to wild nightlife. I can’t believe it took me so long to “discover” it despite the fact I used to live just down the river in Vienna. Alas, I made up for my tardiness by visiting twice in the space of one month. Once by myself, as a me-time wellness retreat with Jet2CityBreaks, and once with a group of friends as a fun weekend break. 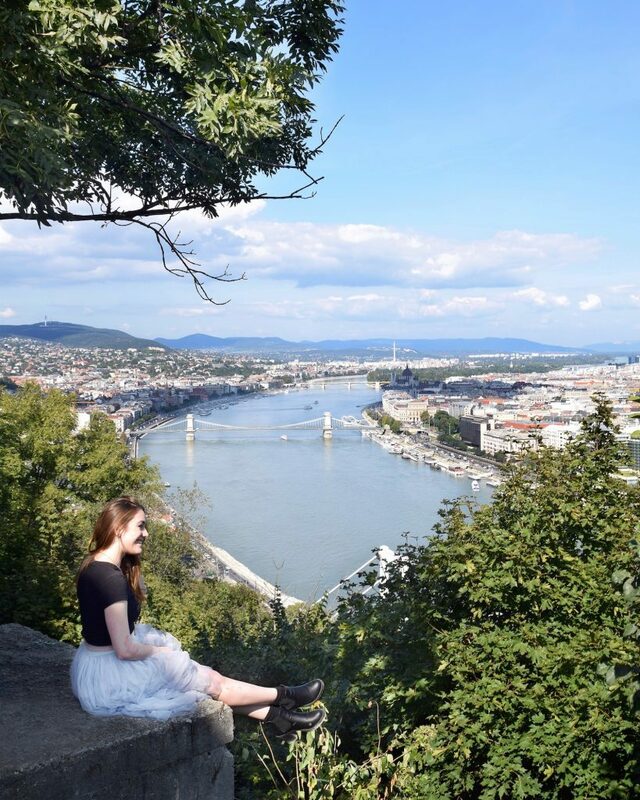 I was amazed by the sheer multitude of things to do in Budapest which is why I’ve dedicated a whole Girl Guide to this lovely city. Although it’s no longer a hidden gem, I’m sure you’ll find something new in here! Let’s start with the obvious. Budapest is the only capital in the world where you can bathe in healing waters day in, day out. The city sits on top of more than a hundred springs which quietly power dozens of thermal baths. Soaking up the sunshine at Széchenyi Baths. The most famous is Széchenyi, the largest medicinal bath in Europe with gorgeous Neo-Baroque architecture. But the most-photographed award goes to Gellért Baths, with their Roman-style columns and Art Nouveau decorations. Vajdahunyad Castle is so pretty it made me see double. Just around the corner you will find Vajdahunyad Castle. 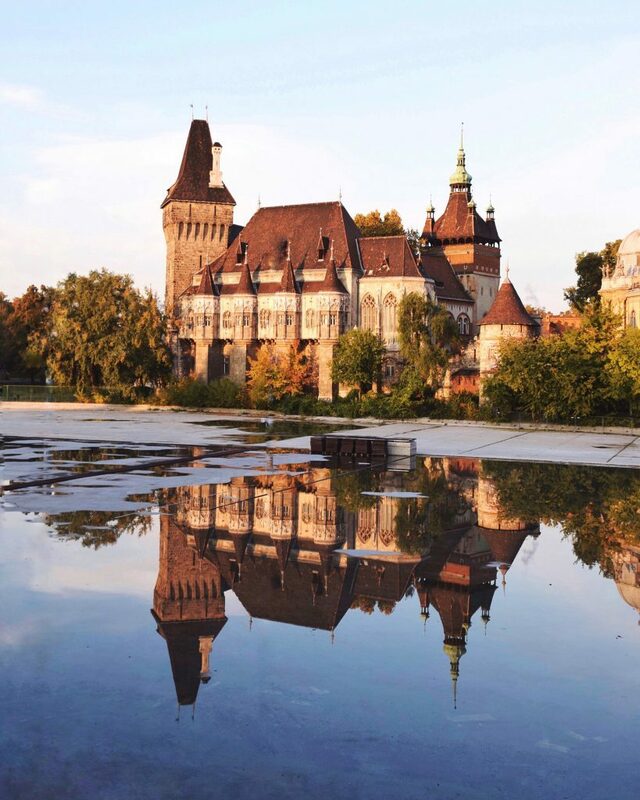 The castle was built in 1896 to showcase Hungary’s long history through architecture. It blends styles from different centuries and elements from the most outstanding buildings all over the country. Pretty cool, huh? Another place you shouldn’t miss if you’re looking for standout architecture is the Parliament. It’s one of Europe’s oldest legislative buildings and probably the prettiest one I’ve ever seen – rivalled only by the Palace of Westminster. 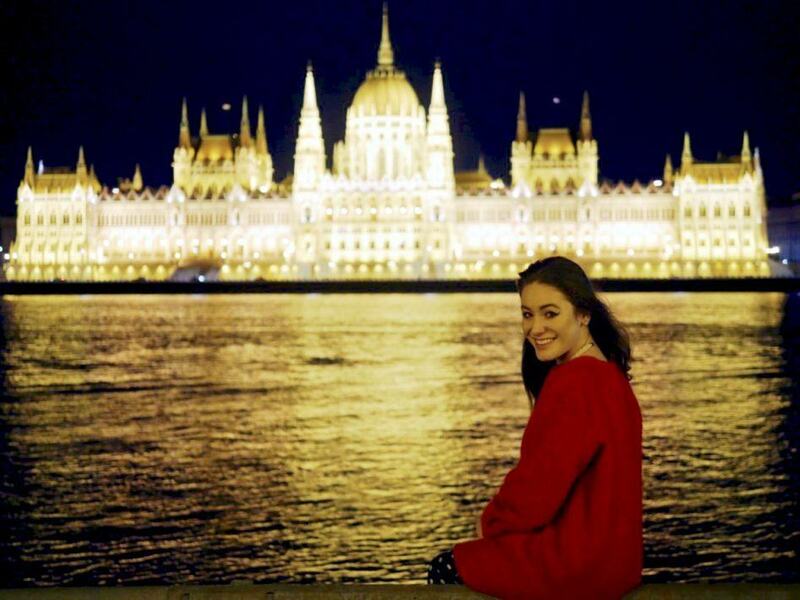 The Hungarian Parliament is so pretty when it lights up at night. But the very first thing I like to do in a new city is look at it from above. Perched 235 metres above the Danube, Gellért Hill is the perfect vantage point. Since 1987, the area has been listed as a UNESCO World Heritage site. While you’re there don’t forget to check out the Citadella (Hungarian for fortress). And don’t worry – although the hill was named after Saint Gerard who was thrown to his death from the top, it’s just a short leisurely walk. Speaking of which, guided walking tours are a great way to explore Budapest. I went on a music heritage tour from Violin Travel, an obvious choice in a place so famous for its concerts and composers. During the two-hour walk I saw a lot of the city centre and visited Vigadó Concert Hall and the gardens at the foot of the Royal Palace. While you’re near the palace don’t forget to visit Matthias Church for its gorgeous tiled roof. 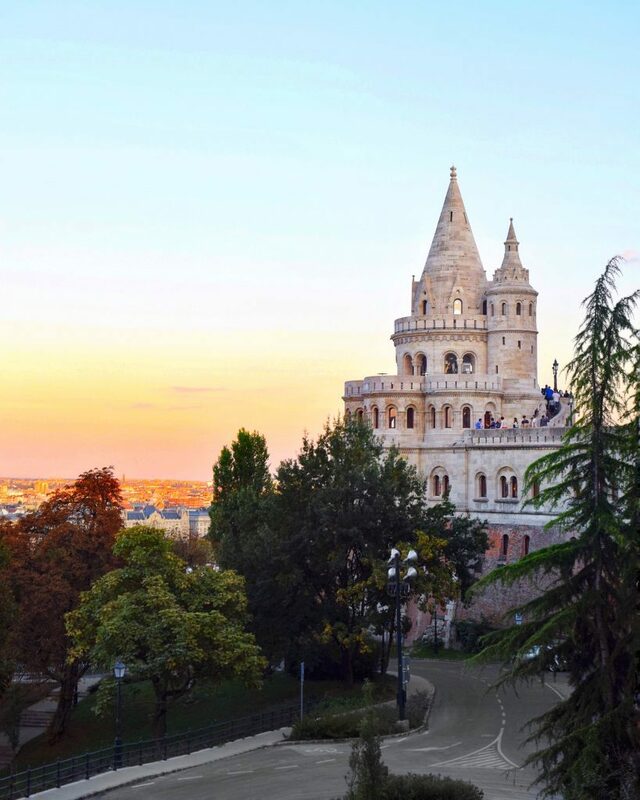 Oh, and if you want to have a little fairytale moment in Budapest watch the sunset from nearby Fisherman’s Bastion. It will make you believe in all kinds of magic! Fisherman’s Bastion at sunset – yup, I told you it was magical. 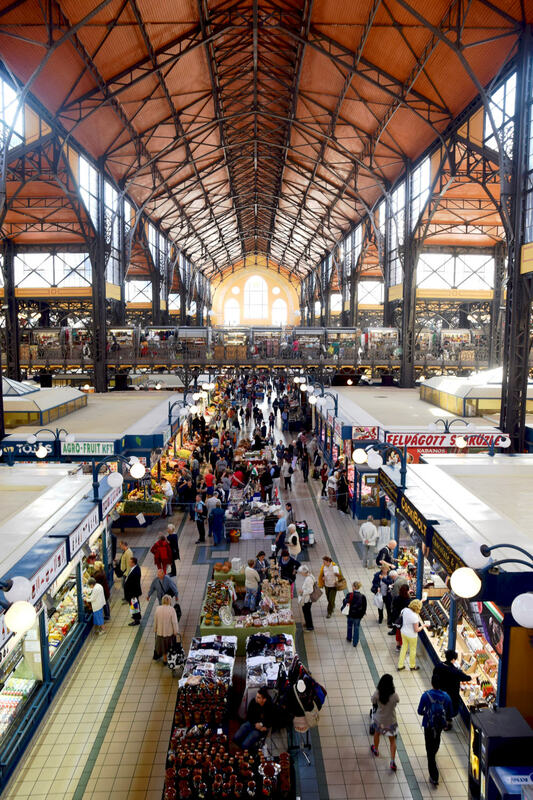 But even more magical is the Great Market Hall, the largest and oldest indoor market in Budapest. Inside you will find anything from caviar and Tokaj wine to paprika and pickled cabbage, not to mention creepy dolls dressed in traditional garments. The market is closed on Sundays, but is open from 6am rest of the week. Don’t forget to go up to the second floor for a quick snack. What should you eat? Skip ahead to the next section. If all the food isn’t reason enough to visit, check out the inside of Great Market Hall. 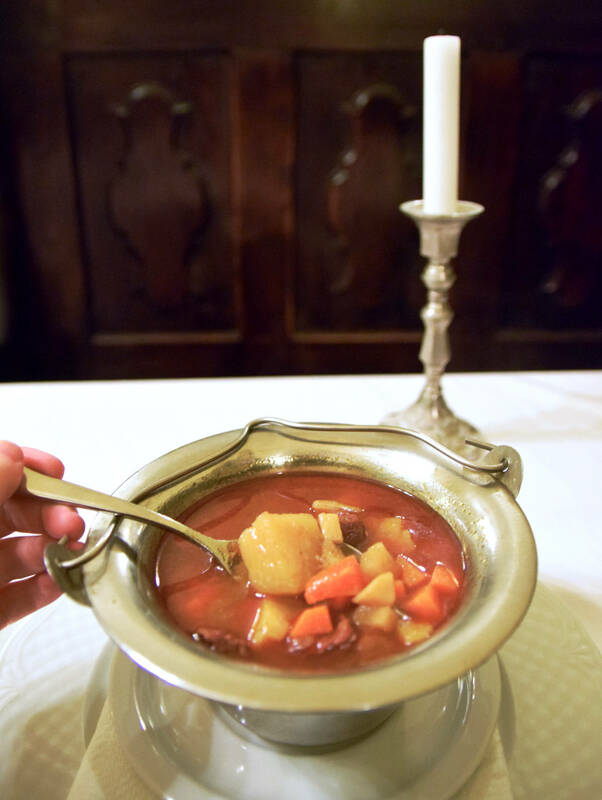 You shouldn’t leave the country before eating a steaming bowl of gulyásleves – traditional Hungarian goulash soup. If you’re after the more filling stew variety, look for székelygulyás on the menu. If you love your soup as much as the Hungarians, here are two more: halászlé (a hot and spicy fish soup) and hideg meggyleves (a cold sweet soup made with sour cherries). For your main try csirkepaprikás. It’s a creamy chicken stew with a lot of sweet paprika which the country is famous for. A great meatless option is lecsó, a ratatouille-like dish with lots of tomatoes and peppers. 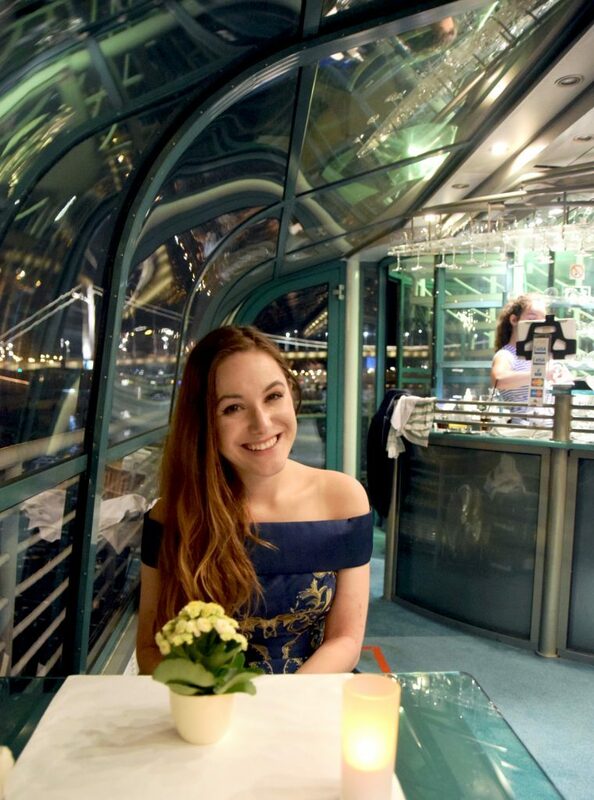 A great way to sample Hungarian food is a candlelit dinner cruise along the Danube – I went on one with Legenda and had a fantastic time. I’m on a boat and, it’s goin fast and I got a nautical themed pashmina afghan ? But my top foodie recommendation is lángos. This Hungarian street food staple is basically just deep fried bread dough topped with a dollop of sour cream. Healthy? Nope. Delicious? You betcha. 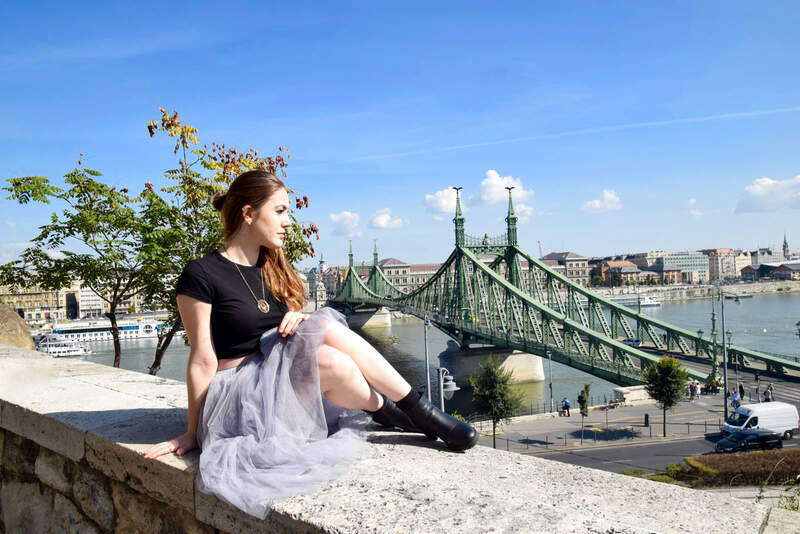 There’s a good reason so many young people love Budapest. The city is relatively cheap and fun. My favourite part of its nightlife scene are ruin pubs. They are abandoned buildings in downtown Pest which have been left to deteriorate, bar a few tweaks by contemporary artists. 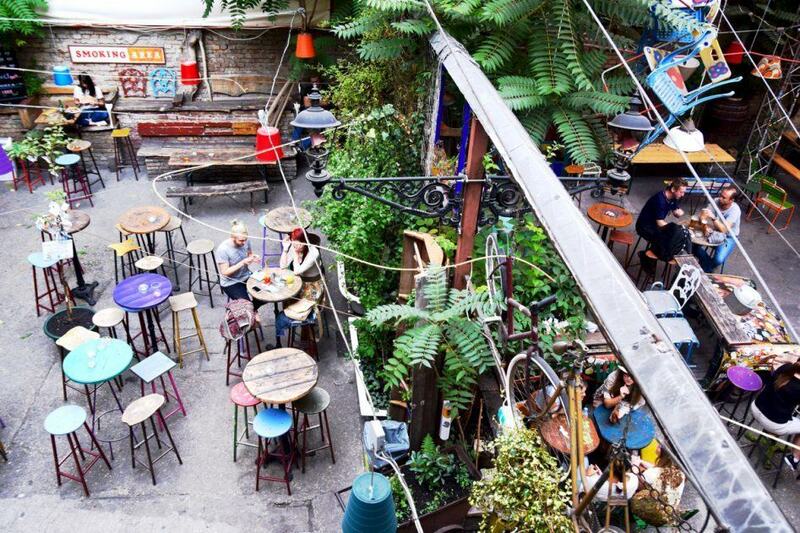 The most famous is Szimpla Kert, the place that started it all. But there’s also Instant, Fogasház and more than a dozen others. Expect a laid-back night and, if you head to one of the bigger establishments, large crowds. 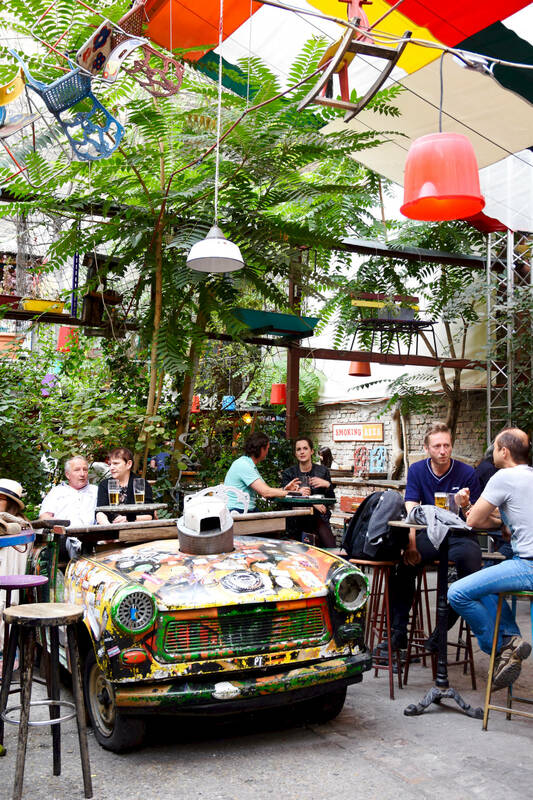 If you want to meet locals at Szimpla kert, get there early. Another great option is one of those sparties at Széchenyi Baths I mentioned earlier. Hot water + lasers + booze = a wild night out. Just remember that there will probably be more guys than girls, and maybe some drunk randos grinding on each other in the pool. On my first trip, I stayed at the stylish La Prima Fashion Hotel Budapest. This was organised by Jet2Holidays as part of their package holiday and I couldn’t fault it. Central location, super friendly staff (who remembered my name by the second evening) and pretty turquoise walls – all big pluses in my book. 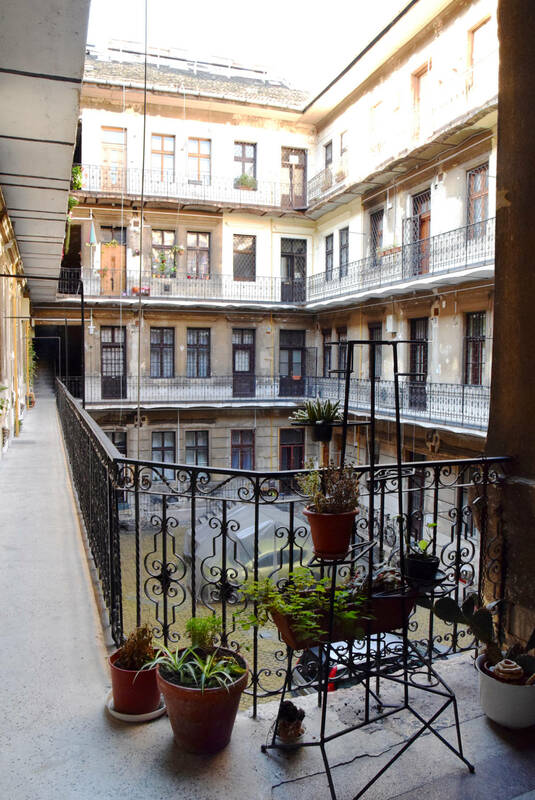 Inside one of Budapest’s residential buildings, just off Andrássy Avenue. During my second visit I stayed in a small Airbnb apartment, which was a completely different experience. Much like the city’s ever-so-popular ruin pubs, the residential buildings are slightly dilapidated – but this only adds to their charm. When I first visited Budapest I flew with Jet2 – an option I would highly recommend to all the UK-based travellers among you. Their prices are low, they fly out of nine cities around the country and were ranked the UK’s top airline by TripAdvisor. If you’re already in Europe consider taking the bus, train or even boat. There are ferries to Budapest from Vienna and Bratislava, although many people find them way too slow, noisy and overpriced. This post was brought to you as a result of the #Jet2Europe blog trip, created and managed by iambassador in partnership with Jet2Holidays. All words, opinions and terrible puns are my own. I absolutely love Budapest! I can’t wait to get back one day! I like the scenery from Hungarian Parliament. It really looks pretty even in the picture. I’m off to Budapest in December so really enjoyed reading this! I can’t wait for magical sunsets and thermal spas! Great post 🙂 Budapest is on my list for next year and I will be looking back at the post for inspiration! I ADORED BUDAPEST! Its such a beautiful city with a vast amount of things to do, we could have done with an extra night or two to fit more in! I loved the stew soups in big loaves of bread. Nom nom. Also, the House of Terror was a sad but truly fascinating experience! Great to see you again last week. Oh! These are such lovely photos! I wanna sit in that bar, Szimpla Kert. Looks relaxing!